What do you do with strawberries that are sitting in a refrigerator that need to be used? 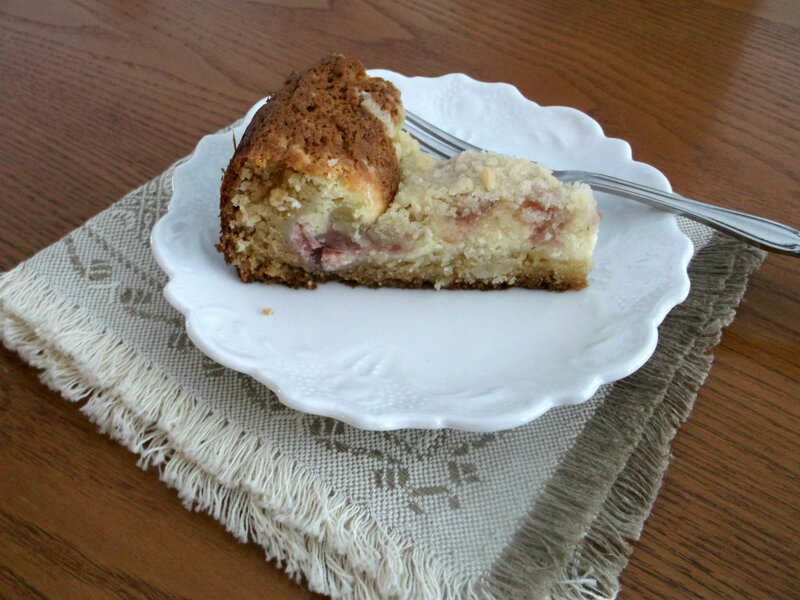 You make strawberry cream cheese coffee cake with them; although it was not my first choice it turned out to be a delightful one. I found a recipe that was a strawberry cream cheese braid that sounded so good that I made that first, but it turned out to be big disappointment. And since I had ingredients left over from my braid I decided to make this coffee cake, which was not a disappointment. 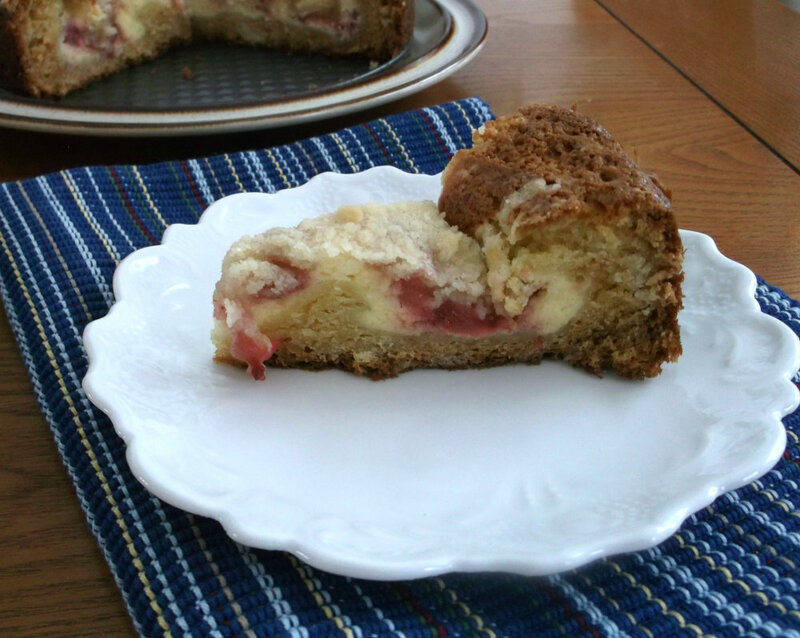 The cream cheese and strawberry combination is perfect and goes well with the moist cake. We ate it for breakfast, but it can be eaten any time of the day you wish. 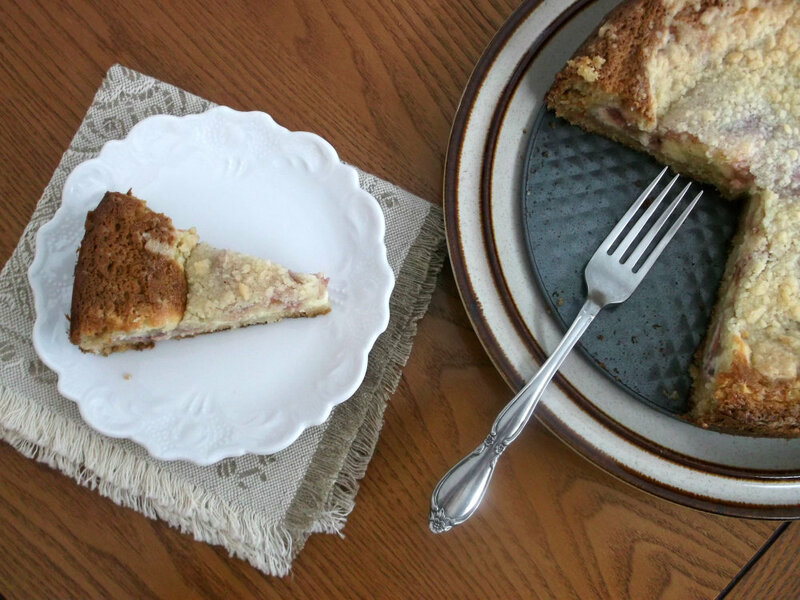 So when you have strawberries that are not so fresh and you decide to bake something with them I hope that you think of strawberry cream cheese coffee cake. I will be the perfect choice. Preheat the oven to 350 degree F. and lightly grease an 8 inch spring form pan. Prepare the strawberry jam – combine the cornstarch and water in a bowl by mixing them together. Mix the strawberries and sugar in a small sauce pan. Cook over low heat until the strawberries release their juices about 5 minutes and then add the cornstarch mix and stir until well combined. Stir for another minute or two until it has thickened. Remove from heat and let cool to room temperature while you make the rest of the cake. Prepare the cream cheese filling – beat the cream cheese for about 30 second until smooth. Add the egg and sugar and beat until well combined. Set aside. In another bowl, beat the sour cream, egg, and vanilla until well blended. Using a hand whisk or a spoon, stir gently into the flour mixture until just incorporated. Batter may be a bit lumpy. Set aside. Spread the batter in the pan, with about 1/2 inch up the sides, also leaving a 1/2 inch border around the edges bare (like making a well). Pour the cream cheese mixture over the batter, being careful not to go beyond the border. Spread the strawberry jam on top of the cream cheese mixture. Sprinkle the remaining 3/4 cup crumbs over the strawberry filling. Bake for 50 to 55 minutes. Cool in the pan on a wire rack for 20 minutes before removing the cake. I love finding new things to do with strawberries this time of year, and I’ve always loved the combination of Strawberries and cream cheese, so I bet this recipe will be a keeper. Good recipe. I often make strawberry sauce with oldish strawberries, but this is a better idea. Thanks! Looks wonderful.